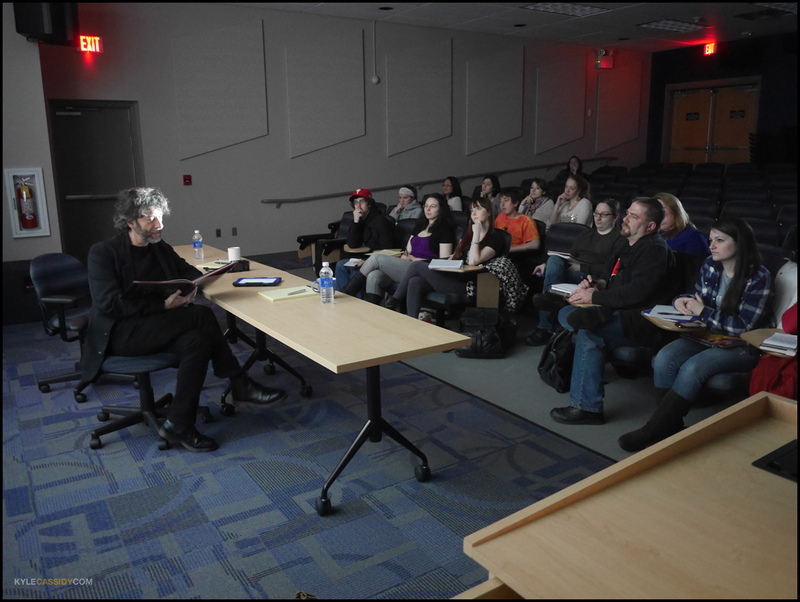 I think the school of Communications at my Alma Mater, Rowan University had been plotting for a long time to get Neil Gaiman to come out and do a lecture and a master class. They wrote me months ago asking if I'd be involved if they could pull it off, and of course, I said I would. So last week Neil & I taught a master-class in storytelling, art, technique and ... making things happen, to a group of students and then Neil gave a lecture to 850 or so people in the giant auditorium where I'd seen Man of La Mancha and Van Cliburn in my youth and where I'd had at least one class during college. I walked across the campus I hadn't seen in decades and felt a bit like one of those movies where all the students come back to their college after the war and it seems different but the same and they want to touch all the door knobs they touched in their youth and stand in all the places they stood and think of the moments and people and events they haven't thought of in years. Every doorway had a memory. Dean of the College of Communications, Lorin Arnold blogged about our visit here and was particularly responsible for so much of the awesome that happened. 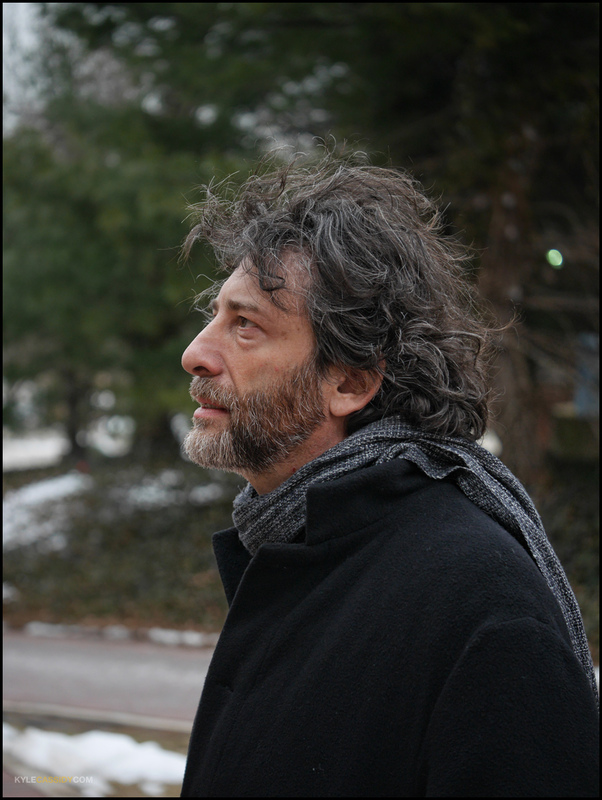 Mr. Neil Gaiman blogged about the day here and includes a few photos that I took of him. Neil reading, me showing slides. Clickenzee to Embiggen! The class went really well. We started out with questions and just took that as a jumping off point to have a conversation about how we worked, how we decided what to work on, and what happens when you devote your time to a thing. We went back and forth for a while, pinging back to the class to make sure they were getting what they wanted. 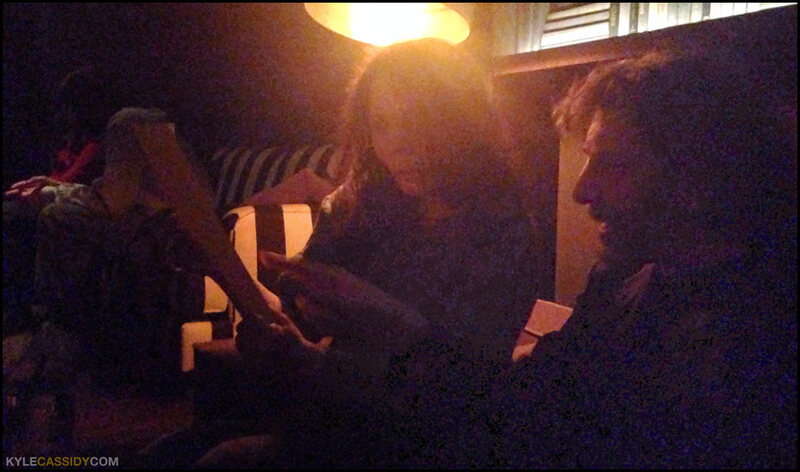 Then we talked about The Big Book of Who Killed Amanda Palmer and I got up and showed some slides, some from the book, and some that didn't make it into the book and that Neil hadn't seen before. Neil talked about why he picked the photos he did to write stories about, how he went about writing them, and the things that he felt inspired by. This was terrific for me as well, since I not really heard him talk before about what motivated him on this and why he'd picked one and not another. Neil reading, class watching, I'm still showing slides. Clickenzee to Embiggen! They'd done a great job keeping the class size manageable so, I think, everybody got time and attention. I met the editor of the literary magazine, Avant, which I'd been the editor of when I was in school there, and the editor of the school newspaper, I'd been the Photo Editor while I was there and it was really great to be able to talk to them about their experiences and mine. Neil had shown up looking a bit like Ernest Shackleton, in that he'd been holed up somewhere writing for months while his wife was off in Australia working for months and he had neither shaved nor cut his hair. "I must photograph this Ernest Shakelton beard" were words that actually came out of my mouth. "Send them to Amanda!" he said cheerfully, because he's mostly always saying things cheerfully, "she hasn't seen it!" They threw us a big fancy dinner with some wonderful faculty and some students who had won an essay contest and everybody called me "sir" which was a bit weird, but not necessarily in a bad way and there were an awful lot of forks and spoons in the place setting. There was something of a forbidden wonder to being brought to the top of the library tower and having people buzz around. One of my English professors confided to Neil "He wasn't a very good English major, but he was certainly unforgettable," which is about the best eulogy of my college years I could hope for. I was indeed a terrible student, and it's nice to know that I was memorable. I was seated next to Julie Haynes, the Associate Dean of the College of Communication and Creative Arts who teaches an incredibly interesting class in something that I can't tell you about because while she was talking about it I said "OMG, I'm totally working on [Top Sekrit Projekt Very Much Related] and a conspiracy began which might push something even better than I'd initially expected into the world. More on that in ... six months. Someone ran up behind me waving a sheet of paper and said "Please! Give this to Mr. 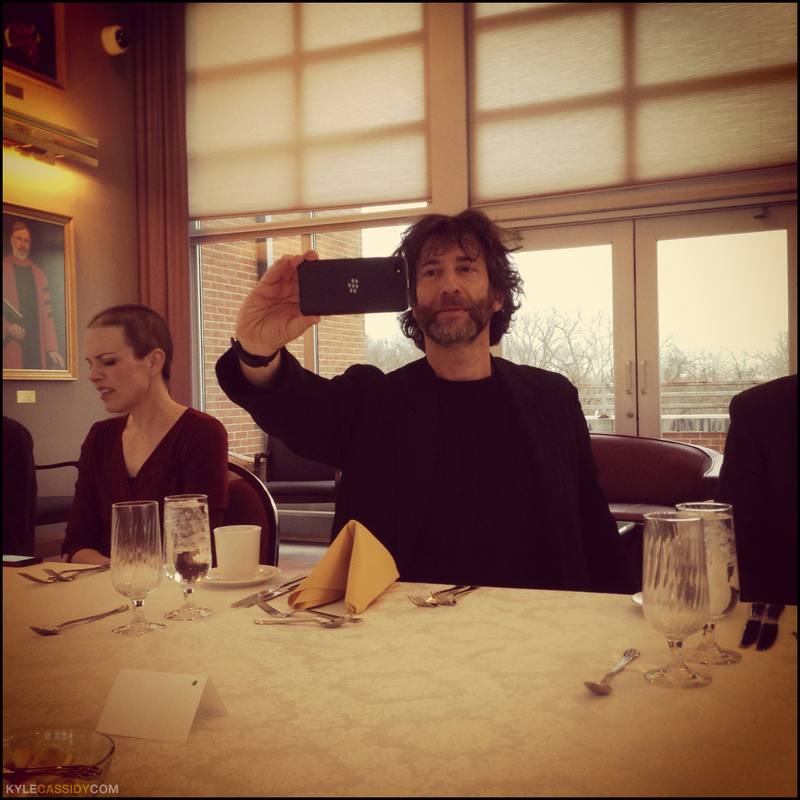 Gaiman!" -- the paper had a ten dollar bill stapled to it. 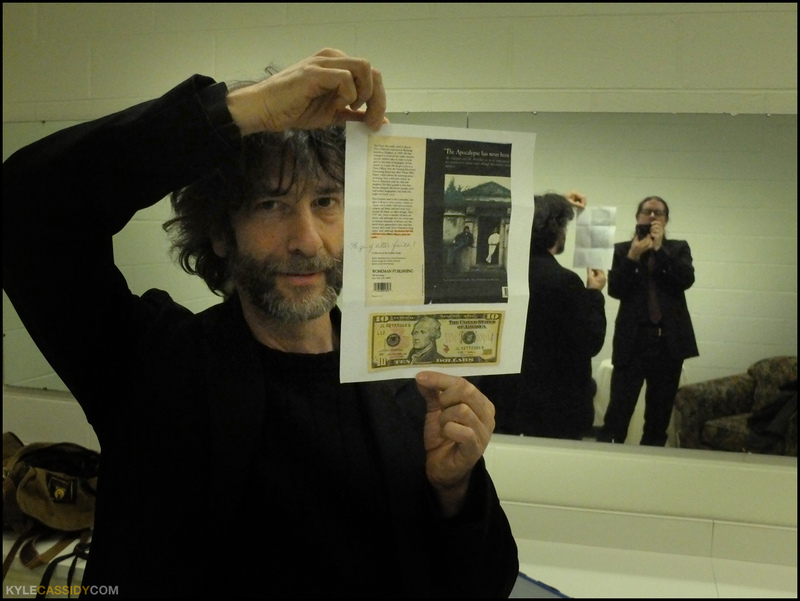 It seems Neil's author bio in the back of Good Omens says something like "Neil likes it when fans give him money" which was a joke based on Terry Pratchett's bio that said something about if you see him you could buy him a margarita. It's a bit overwhelmingly wonderful how The People love Neil and how Neil loves The People right back. This is what being a nice guy gets you. Neil gave a lovely lecture where he answered questions and read a few stories, there was applause, a standing ovation, and I drove back to Philly and picked up trillian_stars who had just finished a performance of Dancing at Lughnasa (where she's playing Kate) and we met up with Neil at his hotel & had a nice unwindy time unwinding and talking about friends and houses and jogging paths. We parted with our heads full of things past and things future and art that we'd loved and things yet to come and plans to make things happen. It was a good day. Thanks Neil & thanks Rowan, Lorin & Julie for making it happen. Indeed, let's. I'm excited for the great wide world tomorrow brings. one wishes the master class was video-ed for the rest of us. knowing more of behind the scenes, and it didn't make the cut, of an art project can be instructive & fascinating. definitely for the WKAP book. "Sir" bothers my eternal child too. I would have asked to be called "Prof" or "Pod" (professor of the day). Great stuff. Always good to know artists are passing on their passion and knowledge to others. That's some impressive facial and head hair on Neil! I'm glad that you have been having a good time. And yes, please, make more art together! I love it when you and Neil do things together and then you both write about it because it's so interesting to see two different perspectives from two very creative, but very different people. RE: Top Sekrit Projekt: MUWAHAHAHAHA!!! It was great meeting and talking with you!